Speedy Frankie Garcia rushes towards the endzone, while teammates and opponents follow. 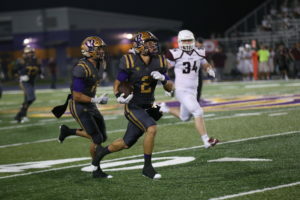 The Pharr-San Juan-Alamo Bears found no mercy at the hands of San Benito Greyhound Varsity Football players Friday night as the ‘Hounds bore down on the Bears 47-20 in San Benito. The contest began on a good note for the Bears who won the coin toss and opted to receive for the opening series of the game, but a second down fumble recovery by the ‘Hounds set the tone for the rest of the game. A swift Frankie Garcia (#2) took an opportunity on first down to achieve a 30-yard touchdown run, the first of the night for the Greyhounds. However, the streak wasn’t over; fans got the pleasure of witnessing another of Jacob Cavazos’ famous trick hand-offs to Garcia while actually handling it to Kyler Castilleja (#20), who scored another full-blown 11-yard TD run, placing the Greyhounds at a score of 12 to the Bears’ 0, all of this within the first quarter.